Could the problem with the METZELER TORRANCE NEXT be because the 100/90-19 is not a radial like the rear (150/70R-17)? I was always told that you did not mix bias and radial tires. Nobody makes a 100/90-19 in a radial. METZELER show the 110/80R-19 as a replacement for the front. The web site also shows the ROADTEC 01 as a replacement for the NEXT. I am going to try the ROADTEC 01 on my next tire change. I have put Avon Trailrider 110/80 19 on the front of both my Tigers and the improvement in handling over the Scopion and Next OEM tyres is like magic happened. A radial front is more suspectible to punctures in off road situations than the bias ply tyres that are standard so I suspect that is why Triumph go with the bias ply tyres. Whilst there may be quantitative tests / evaluations for "handling"?, it's mostly a value judgement (IE, up to the individual...). Maybe, especially true when it comes to motorcycle handling? 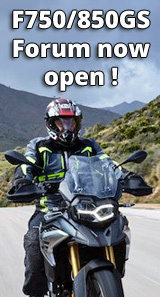 "Handling" attempts to describe the way a m/c responds and reacts to the inputs of the rider. Handling is a property of the m/c, but different characteristics will work well with different riders. Handling is not necessarily good or bad -- it can also be 'the same' or 'different'. Triumph's engineering requirements may've emphasized the Tiger800's "all-rounder" attributes over handling? M/Cs that tend to emphasize handling over other considerations are often called sport-bikes. I will just ring its neck a bit more lol. But all things aside it does grip the road better. Will just see how they go. I was always told that you did not mix bias and radial tires. ..... on the same axle, which the Tiger complies with, they are not mixed. That statement applies to cars, etc. Purely as an observation based on the numerous tyre posts over 2yrs of membership and lack of Bridgestone chosen choice related/user posts maybe your choice of BT23 just doesn't suit the Tiger as well as it has your previous bikes? I only recall one or two members saying they are happy with 100/90-19 so haven't gone/tried 110/80-19 and only positive feedback from the masses who have gone 110/80-19 radial, the main 100/90 bias moan being bad whitelining which the 110/80 rectifies (certainly did for me). I've gone with the successor to the BT023 , the T30 Evo. BT023s worked well on my Tiger 1050 (and, indeed, a Trophyand a Sprint ST 955i). The T30 Evo has the same characteristic as ENGLISHBANDIT mentions in another post, a definite eagerness to drop in, and now I'm used to it, it feels fine.